There's a new Saint Seiya movie. And a new movie means a new movie poster. Well, two new movie posters, one of which apparently keeps getting swiped. 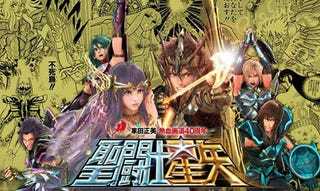 Here is the standard Saint Seiya: Legend of Sanctuary poster. And here is the special Legend of Sanctuary poster, with a background drawn by Saint Seiya creator Masami Kurumada. The posters are printed on fancy shiny paper! The poster was put up at forty Japan Rail stations across the country, initially only for a limited time (a week, I believe). But the reaction was so strong online to the poster, they brought it back. And people stole it! But, according to Oricon (via Yahoo News Japan), people have stolen the poster in Tokyo at Shinbashi Station, Roppongi Station, and Ebisu Station. This kind of theft, obviously, is somewhat rare in Japan, hence it making the news. Yes, stealing a special anime poster. News. Deal with it. It's a nice poster, but don't steal it!